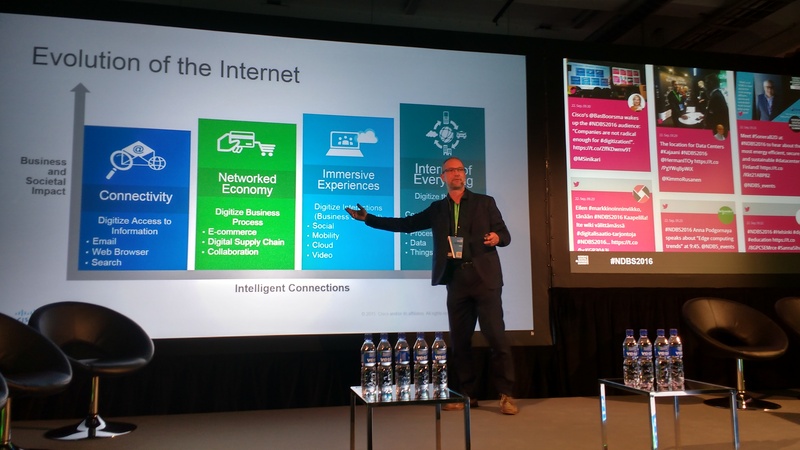 Digital transformation is one of those ubiquitous buzzwords; everyone offers it and everyone’s doing it, but Cisco’s Bas Boorsma think not many companies get it. The internet is a wonderful thing for some and a torment for others. It offers small organizations the opportunity to engage the world, while at the same time removing some of the advantages big business has lauded over entrepreneurs for years. Speaking at the Nordic Digital Business Summit in Helsinki, Finland’s Minister for Economic Affairs Olli Rehn described the internet as “truly democratic” and a saviour for innovators. But all this new opportunity comes at a great price. Cisco’s Director of Internet of Everything & City Digitization Bas Boorsma (pictured below) highlighted to the audience at the same conference that “Digital Darwinism is very unkind to those who wait” and the concept of ‘Too big to fail’ which plagued the world throughout the noughties is a thing of the past. Expanding on that somewhat cryptic opening Boorsma made a contentious claim that 40% of today’s businesses will no-longer exist in 10 years. Whether this is due to consolidation, rebranding or bankruptcy was not made clear, but natural selection looks set to go into overdrive. The main challenge is not the acceptance of change, but the speed. Although many of the more traditional organizations were slow to transform their business models to the digital ecosystem, it is now top of the agenda. But the issue here is of speed and mindset. To innovate a change in mentality is needed and the fail-fast business model is another buzzword which has crept in, though here there seems to be sense to the buzz. Big business does not allow creatives the opportunity to fail, because failing is not acceptable. For the internet businesses which has taken the world by storm (Facebook, Twitter, AirBnB, Uber etc.) failing is a way of life, and encouraged if there is a lesson to be learnt. The development of the internet was not linear. There have been random explosions of development heading off in different directions, and then once again converging. The speed of change in increasing, and the future is becoming more difficult to predict. According to Boorsma, this is the essence of disruptive models and the cause of heartache for the more traditional organizations of the world. If an organization is happy with its digitization strategy, it probably needs to have a rethink and up the pace once again. In an internet age, dominated by non-linear and often explosive development, fast is never fast enough.